Toptal is proud to sponsor Front In Vale 2017 which will take place in São José dos Campos on September 16th. During the event, there will be several speakers, including Gabriela Casagranda. 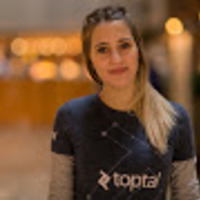 Gabriela will give a talk from 1:30 PM -2:30 PM about recruiting in tech. During the talk, you will hear more about the do’s and don’ts in hiring practices to challenge the talent shortage in tech companies and global communities. For more information on the speakers and schedule, please see the event website or contact Victoria Marafetti.